Aspatore Navigating Post-Conviction Appeals gives you an in-depth look at challenging convictions on appeal, as well as what the odds are for defendants to win and possibilities for postconviction relief. When it comes to postconviction appeals, understanding the process is just as important as understanding the legal challenges you will need to overcome. Knowing how the defendant was convicted, what evidence was involved, and which motions can be most helpful to your client can make an otherwise grueling process smoother. 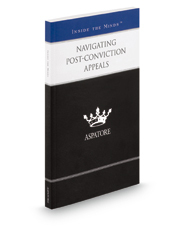 Aspatore Navigating Post-Conviction Appeals, authored by highly experienced partners from law firms across the country, addresses these issues and more. Using techniques from their own practices and firms, these authors explain direct appeals, Section 2255 motions, Rule 33 motion for a trial, and when to petition for writ of error coram nobis. They offer best practices for assessing the effectiveness of counsel; discuss whether or not you can appeal on new evidence; and your client's options if the appeal is denied. They also cover highly specific topics that range from determining the appropriate venue based on a defendant's initial sentencing, to explaining how motions for compassionate release and presidential pardons work. The appeals process is often difficult, but with this book you'll be able to successfully navigate many of its obstacles.